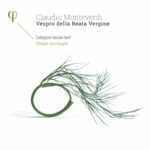 If there were one composer who embodies the transition from the Renaissance to the Baroque, it would have to be Claudio Monteverdi. Born in 1567, in his long career as a violinist, singer, maestro di capella and composer, he was at the Gonzaga court in Mantua and San Marco in Venice. His music walks the fine line between tradition and revolutionary innovation, whether sacred music, opera or madrigals. His compositional evolution can certainly be closely followed in the eight madrigal books he published between 1587 and 1638. Un giro de begl’occhi is a refined anthology of the most beautiful madrigals from this oeuvre in which we witness Monteverdi’s constant search for the expression of the human pysche!